The Ontario Reign hosted the Manitoba Moose and took on the San Jose Barracuda in a home-and-home series last week for a week record of 3-0-0-0, improving their overall record to 24-10-2-1 to hold the top position in the Pacific Division. Ontario is currently riding a four-game win streak. The Reign and Moose collided on Wednesday night for this first time since early October at Citizens Business Bank and skated away with a 4-1 victory. 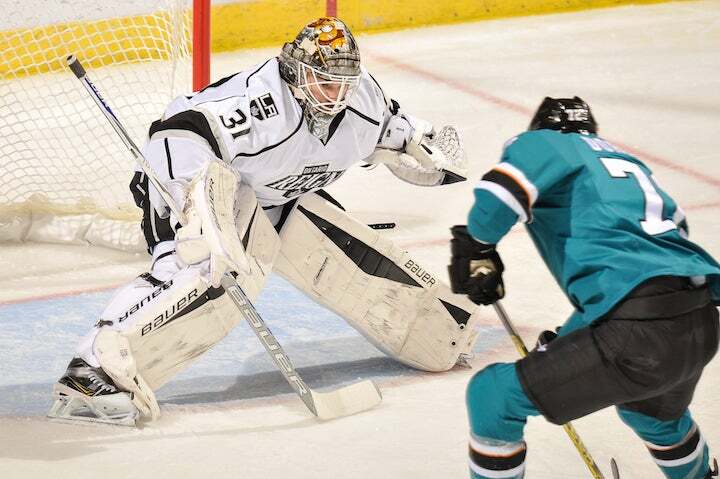 Michael Mersch recorded a goal and two assists and Peter Budaj registered his 200th professional win. On Friday, the Barracuda rolled into the Inland Empire and carried a 2-0 lead heading into the third period before 2016 AHL All-Star Classic members Vincent LoVerde buried an early-period marker and Sean Backman tallied the game-tying goal with 1:32 left in the frame. Just 28 seconds into overtime, Nic Dowd buried the game-winning tally to complete the Reign comeback. The two teams moved to SAP Center in San Jose Saturday with the Reign completing the weekend sweep with a 2-1 win. Kurtis MacDermid lit the goal lamp in his first game back from a 12-game suspension and Backman netted the game-winning marker. Forward Ryan Horvat is tied for fourth in the AHL with nine major penalties. Forward Sean Backman is tied for first in the AHL with 124 shots and forward Michael Mersch is tied for fourth with 116 shots. Goaltender Peter Budaj leads the league with a 1.69 goals-against average, five shutouts, 22 wins and 1984 minutes played, stands third with a .930 save percentage and fourth with 749 saves. Defenseman Kurtis MacDermid is tied for third among rookies with 70 penalty minutes. Defenseman Vince LoVerde is tied for 20th among defensemen with 21 points (5-16=21) and tied for fifth among blueliners with 20 minor penalties.